Some readers of Jane Austen's Sense and Sensibility (1811) imagine a different ending, in which the romantic Marianne marries the dashing Willoughby after all, and the reserved Colonel Brandon finds solace by marrying her sister Elinor. If you're one of those readers who think such an ending would best match the inclinations of each sister and suitor, you may have to think again. Jane West anticipated your feelings in A Gossip's Story (1796), and the results are not all that happy. West's novel also features two sisters: a younger one named Marianne (perhaps Austen's Marianne is an homage), who is full of impassioned sensibility, and her more circumspect elder sister Louisa. Marianne is courted by Henry Pelham, who possesses "an open, ingenuous countenance, manly sense, and easy accommodating manners" (Ch. V). However, she is not looking for a husband who exhibits such amiable virtues. She rejects him in favor of the more impetuous and ardent Mr. Clermont, who better fits her idea of a lover. Meanwhile, Louisa feels drawn to Mr. Pelham, but cannot make her feelings known—at first because he is the declared suitor of her sister, and later because her father's unwise investments reduce the family to relative poverty. Marianne, though, is independently wealthy thanks to a legacy from her grandmother, and can marry whom she pleases. But the marriage of Marianne and Mr. Clermont is not a success. He inevitably plays the ardent, indulgent lover less and less, and hangs out with his drinking buddies more and more. Meanwhile, Marianne confides her disappointments to her best friend, Eliza Milton, who commiserates with her friend and has no hesitation in abusing her husband's character. A deep rift grows between husband and wife, fomented by Mr. Clermont's malevolent mother, who feels that Marianne isn't sufficiently high-born for her son. A jest upon the subject of female usurpation is dreadfully grating to lordly man, and it is peculiarly so when (as in the present instance) it happens to apply. Mr. Clermont declined his lady's invitation to breakfast, and as soon as his friends had set off, retired to his library, and there continued to pace the room with desultory steps; frequently imagining he had caught a glimpse of the chains which Hymen is suspected to wear under his long saffron mantle. The couple argue, particularly after Mr. Clermont learns that his wife has been sharing feelings with Eliza Milton that she has not expressed to him, and allowing Eliza to criticize him severely. He demands that Marianne break with her; tears and anger ensue. The breach between husband and wife is only healed at the urging of Marianne's father. Clermont asks for Marianne's forgiveness sincerely, if a bit reluctantly; and while Marianne acquiesces, she is still bitter at the demand that she repudiate her friend. This advocacy of calculating submission in wives is objectionable not only for modern readers. A Gossip's Story was published just four years after Mary Wollstonecraft's A Vindication of the Rights of Woman (1792), which urged men to "be content with rational fellowship instead of slavish obedience." But if, as West's entry in the Oxford Dictionary of National Biography has it, "where Wollstonecraft advocates 'Rights', West insists on 'Duties'," the two writers actually share some common ground: both are suspicious of the cultivation of excessive feeling in women, which undermines their claims to equal rationality with men. In the dedication of her novel West, who introduces it under the pseudonym Prudentia Homespun, wrote that the work was "intended to illustrate the Advantages of Consistency, Fortitude, and the Domestick Virtues; and to expose to ridicule, Caprice, affected Sensibility, and an IDLE censorious Humour." While these animadversions are aimed primarily at her women readers, as West's ironic comments about "the 'Lords of the creation'" indicate, she was deeply skeptical of men's claims to inherent superiority. 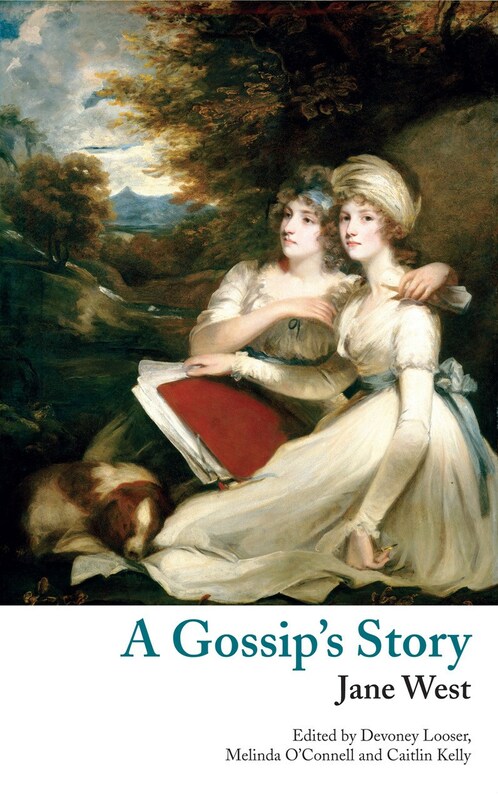 A Gossip's Story would be of great interest as one of the sources that inspired Sense and Sensibility (along with Charlotte Smith's Celestina, which features a character named Willoughby), and also as a response to Wollstonecraft's Vindication. But it deserves to be read in its own right for West's keen observations on human foibles as well as her frequently ironic narrative voice, which (despite the deferential advice for women) can feel very modern. As the editors have rightly described it, A Gossip's Story is "by turns thoughtful, moving, and dryly witty." You can read more of their thoughts about editing the novel on Aphra Behn Online's Bluestocking Salon. For more on the writers who inspired Austen, see Jane Austen's predecessors. Update 22 December 2018: A Gossip's Story was selected for my Favorites of 2018: Books.